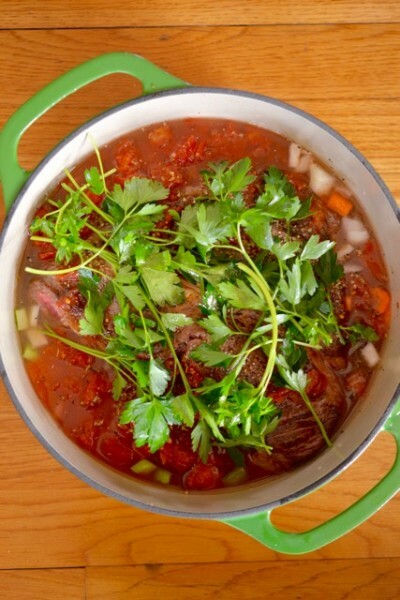 This pot roast was inspired by watching Michael Pollan’s documentary “Cooked” on Netflix. You cook it low and slow…and then enjoy all of the incredible flavors. 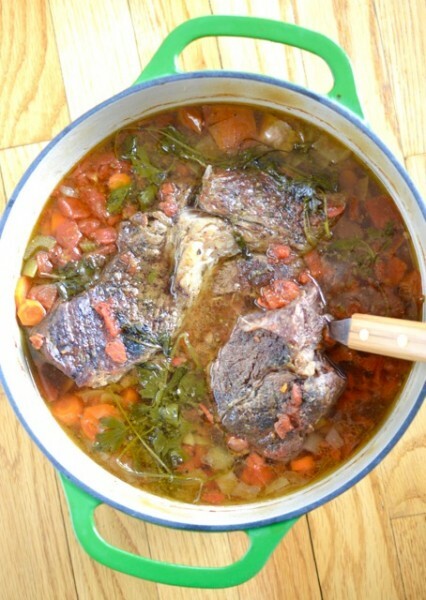 A pot roast cooked low and slow to bring out all of its succulent flavors. Pat the roast dry and rub it with salt and pepper. Heat the olive oil to a large heavy frying pan and add the meat, cooking it for 4 to 5 minutes on each side so it is browned. Meanwhile, prepare your cooking vessel - a large ovenproof casserole dish or Dutch oven is best. Put down a layer of carrots, celery, and onions. Place the meat on top of the vegetables. Pour the tomatoes and broth on top, reserving about 1/4 cup of the broth. Use the 1/4 cup of the broth to deglaze the frying pan - whisk it around in the pan until it picks up the flavorings and juices from the pan. Pour the remaining broth over the meat. Layer parsley and herbs on top of the meat. Cover the Dutch oven and place in a preheated 275 degree oven. Cook for 3 hours to 3 1/2 hours for a 3-pound roast (figure on longer time for a larger roast). Remove from oven, slice, and serve.